About us Who is Planiclik for? It will save your marriage or cheer up your divorce! Planiclik is much more than just a shared calendar! Planiclik is a private family space that allows for effective planning of your family schedule. Each user can log in with their own username and password. Family organization and communication have never been so simple! Better manage work family balance. To easily manage your family schedule. To reduce stress and conflict. The best thing that happened to families since mac 'n' cheese! "I love Planiclik and the effort made to make the user experience simple and effective. We (my family) were using Google Doc before. 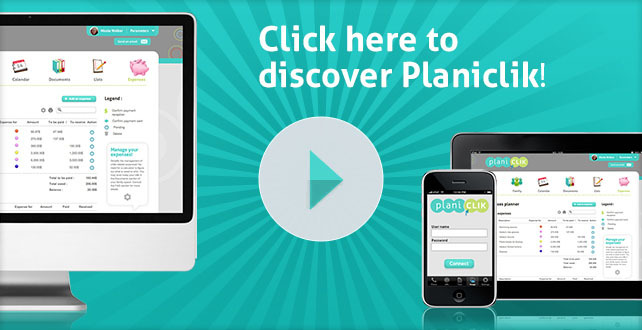 Planiclik is doing better in a sense and knows much better its target users: those families who need a simple interface, accessible from anywhere, that can help them better communicate and share information to manage their daily life." "Work-life balance is a challenge experienced daily by a lot of parents. We all need a hand getting organized with our family schedule. I find this tool not only useful, but how practical and easy to use. It is comprehensive and allows everyone involved staying up to date with their family schedule." Are you a family lawyer or mediator? Recommend Planiclik to your clients.